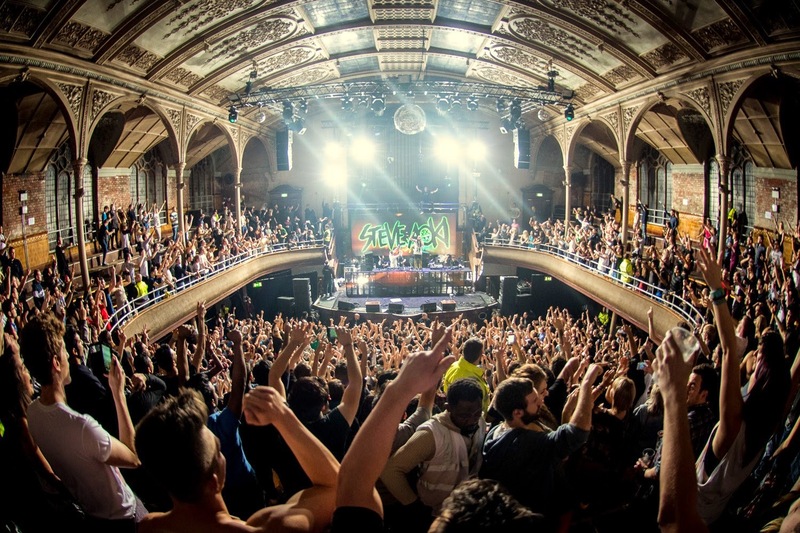 Steve Aoki graced Albert Hall with his presence on Saturday night - it was the 3rd week of the Transmission event and certainly one not to be missed. The 37 year old EDM DJ is somewhat of a global superstar having played 240 shows and earning himself over $23 million last year. I wanted to know what all the hype was about. EDM isn’t really my thing. To me the DJ’s are overpaid, over-played chart-topping eccentric individuals who love to jump around someone near their decks – giving off the impression they care less about the technical act of mixing records, and more on playing the crowd. YouTube is swamped with videos of Steve Aoki around the world: Tomorrowland, Vegas, Creamfields, each show as energetic as the last, cake flying into the audience, balcony jumping, surf crowding, you name it. There was also one instance where the guy almost died, after a trampoline trick (again, he’s a DJ, where’s the DJing?) literally back-fired. So personally I was hoping it was going to be a bit of an eye-opener, and could even change my opinion. I wanted a show, I wanted the lights, the sound and most importantly I wanted the cake! The doors opened at 9pm and steadily the queue built up outside the venue. As more people started arriving I was surprised to see how many signs were appearing with “CAKE ME AOKI” etched on them in Sharpie. When I walked in the venue – I didn’t think something like that would work but it really did. The recently restored church left me amazement with its huge main room centred on a stage at the rear, high decorative ceiling and even stained glass windows to complete the look. At the side of the stage there stood two huge speakers and dotted around the pillars, there were more speakers making sure the sound reached every nook and cranny of the impressive venue. The other acts got the night off to a steady start ready for Aoki. Lempo, a Manchester DJ, kicked it off with some ultra-funky tunes at 9.00pm. I accosted him after his set to ask how it went. 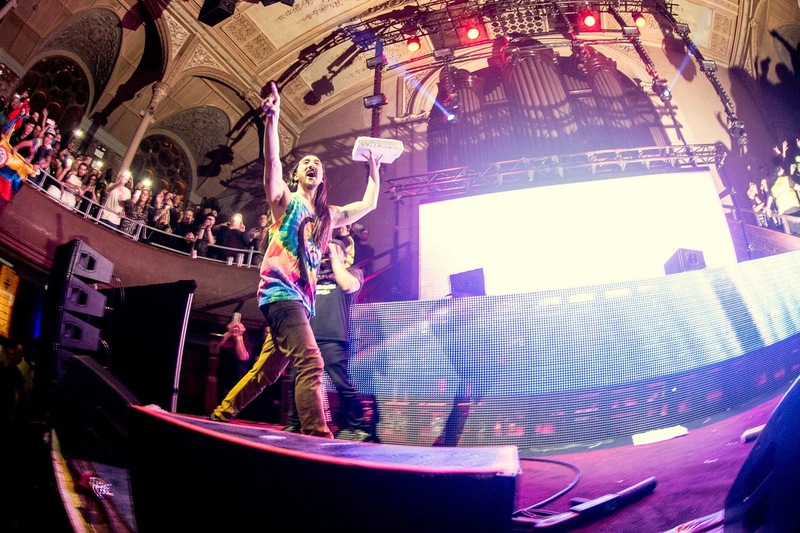 Steve Aoki quite literally ascended on to the stage dressed in a tie die vest with his face printed on to it. The crowd, myself included, went wild. An uproar of screams flooded the Albert Hall. The 2011 smash ‘Turbulence’ originally written with Laidback Luke featuring Lil Jon was met with predictably hysterical screams. Then it finally arrived. Yes, you guessed it. Aoki was passed a huge rectangle iced cake, and launched it into the crowd. Icing flew through the air covering all those in its way. Whilst the act itself seemed insane, it was a testament to the man’s performing ability. 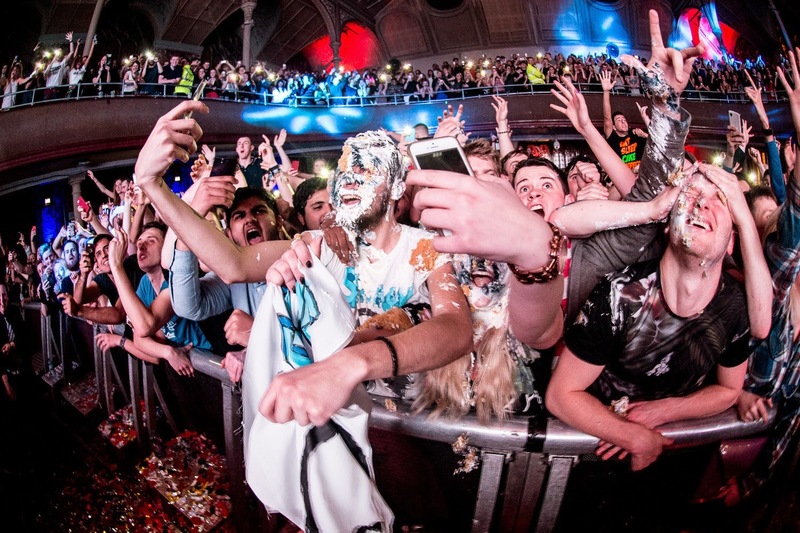 Not everyone has members of the public lining up so they can have a cake thrown at them. Aoki is more like a rock star than a DJ, even fitting in a quick costume change middle of his set. Kid Kudi’s cut ‘Pursuit of Happiness’ came and went, the crowd at this point trapped in some kind of weird twilight zone, hanging on Aoki’s every action and movement. It was scary. 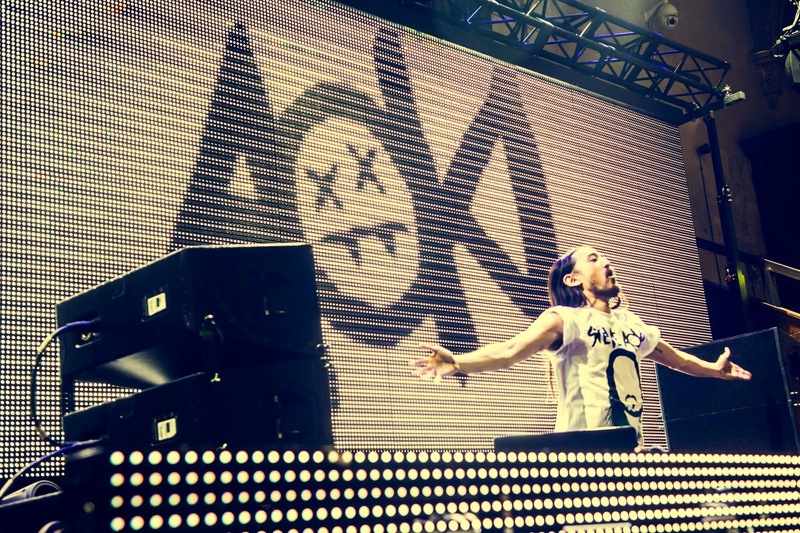 Aoki’s well known for favouring electro remixes of indie & rock anthems, and he’d obviously done his homework on his host city’s musical heritage. Oasis’s ‘Wonderwall’ was the choice, and for a few minutes the entire Albert Hall became 5th Ave at closing time. The crowd was swaying left to right, the whole room moving and singing along. But an Aoki gig can’t be finished without a group selfie and a dinghy right? Apparently it can’t, seriously. The audience was attached to him, his performance was lapped by everybody there – he is a showman, and it shows. One lucky fan took full opportunity and attempted to dive on the dingy surfing above the crowd’s heads. Ticker tape fell from the roof as the show came to an end. All in all it was actually a pretty crazy night. It had all the components for a great show, firstly it was sold out, great stage, lights, crowd, and performers. Steve Aoki is a wild cannon who might not be my favourite DJ or the best DJ, but he embraces what he’s got and he loves his job and most importantly the crowd loved it, the atmosphere was amazing. Aoki is certainly an acquired taste, and will not be winning over any serious fans of electronic music any time soon, but kudos to his ability to get his fans eating out of his hands… He’s scary-good at that.